“The editors of your paper are Catholic, and have refused… to give this campaign radio time and press notices… We do not ask the Catholics to accept our program–we merely ask them to ‘live and let live. 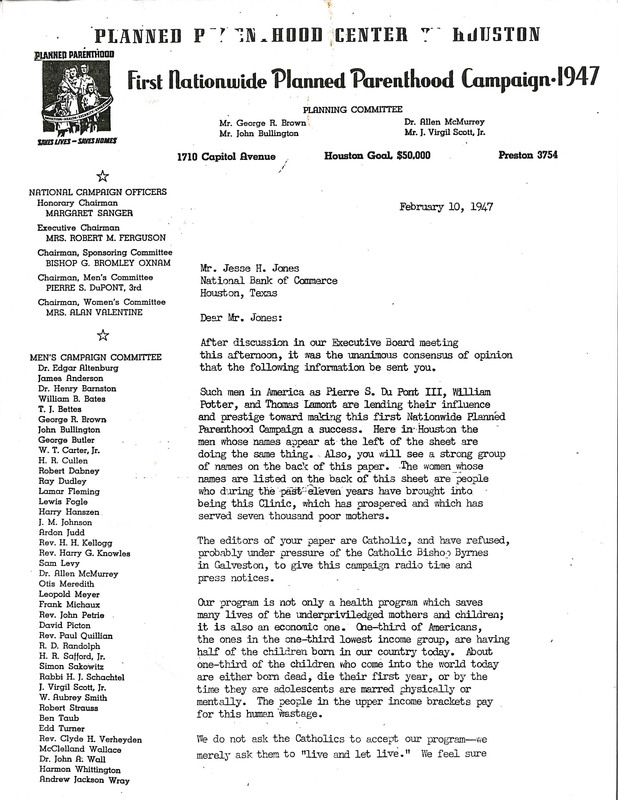 '” Letter from Agnese Carter Nelms to Jesse H. Jones, February 10, 1947, Planned Parenthood of Houston and Southeast Texas Records. A new collaboration between the University of Houston Special Collections, the Department of History, and the Women’s, Gender & Sexuality Studies provided students with a unique opportunity to discover archival collections neatly aligned with their own areas of research interest. Students from Dr. Zarnow’s Issues in Feminist Research class worked with librarians from our Special Collections to mine a variety of archival artifacts in collections from Carey C. Shuart Women’s Research Collection, the LGBT History Research Collection, and the Arté Publico Press Recovery Project to create an interactive timeline of primary sources discovered in their research. From materials tucked into archival folders, possibly overlooked by previous researchers, students uncovered items revealing the evolution of women’s social issues and concerns in the Houston and Gulf Coast region and the themes that connect these years of seemingly disparate work from a chain of individuals and organizations over decades. Boycott Gallo flyer, Houston Area NOW and Other Feminist Activities Collection. 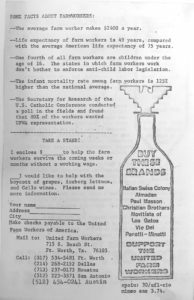 Among the items highlighted from their research are correspondence from the 1940s, political flyers from the 1970s, and artists’ creations from the 1980s. 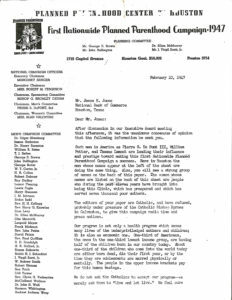 In the Planned Parenthood of Houston & Southeast Texas Records, a 1947 letter from Agnese Carter Nelms to Jesse H. Jones, owner of the Houston Chronicle among other things, hints at the early conflicts between Planned Parenthood and the Catholic Church. 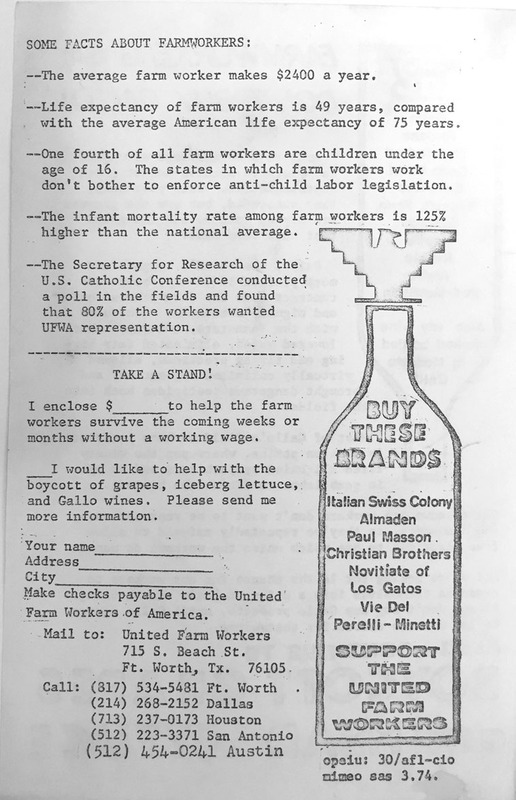 A flier from the Houston Area NOW and Other Feminist Activities Collection recalls the gains won by César Chávez and the United Farm Workers but reminds us that, even now, there’s still blood in that wine. 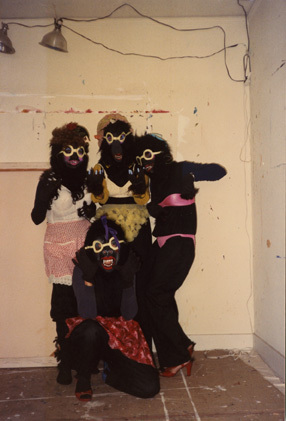 Meanwhile, photographs, posters, and other works of art from the Houston Gorilla Girls Records demonstrate how activism for gender equality in the world of art played out against the backdrop of 1980s Houston. Students worked to curate and describe these items and more, creating an interactive timeline (seen above) to provide users with visual and historical context while browsing their findings. Photograph from the Houston Gorilla Girls Records. If you are a faculty member, or student, interested in how the primary source materials housed in UH Special Collections can complement your teaching, learning, and research, see our website with more information on scheduling classes and utilizing our resources to learn more. The University of Houston Special Collections is pleased to announce the recent donation of the Olive M. Jenney Collection. Hispanic Collections Archivist Lisa Cruces discusses the recent donation of the Olive M. Jenney Collection. This collection of approximately 50 books was acquired by Jenney, a Texas native, throughout her decades spent in Latin America. 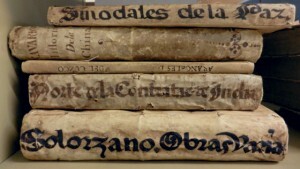 The books date as far back as 1639 and cover the history of the Spanish exploration of the New World, Spanish interactions with the indigenous populations, and also include materials focusing on Spanish laws and customs relating to the Catholic Church as well as trade with Spanish colonies. The majority of the books are in Spanish and published between the 17th and 19th centuries. 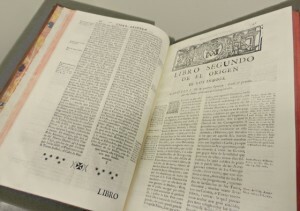 Highlights from the collection include a complete set of Antonio de Ulloa and Jorge Juan y Santacilia’s Relación histórica del viaje hecho de orden de su Majestad a la América Meridional (1748), Recopilación de leyes de los Reynos de las Indias (1681), as well as Gregorio Garcia’s Origen de Los Indios de El Nuevo Mundo E Indias Occidentales (1729). The arrival of the Olive M. Jenney Collection immediately sparked interest from UH faculty. Already in the fall of 2015 we have seen the collection utilized in instruction and coursework related to Latin American environmental history. In the spring of 2016 we look forward to formally introducing the Olive M. Jenney Collection with a celebration and panel discussion, while the books themselves will continue their hard work. Ripe as this collection is with the potential to impact research and instruction, we look forward to expanding the instruction footprint into more Latin American history courses in the spring and are pleased to see Hispanic Studies faculty making early research plans with us for 2016. Faculty members interested in utilizing these materials for instruction, or those simply interested in more information regarding the Olive M. Jenney Collection, please contact our Coordinator of Instruction, Julie Grob. As work ramps up on the organization, arrangement, and description of the recently accessioned Tatcho Mindiola Papers, Hispanic Collections Archivist Lisa Cruces sat down with PhD candidate Carlos L. Cantú to discuss his early impressions this new collection. Lisa Cruces: What made you interested in working with Tatcho’s Collection? 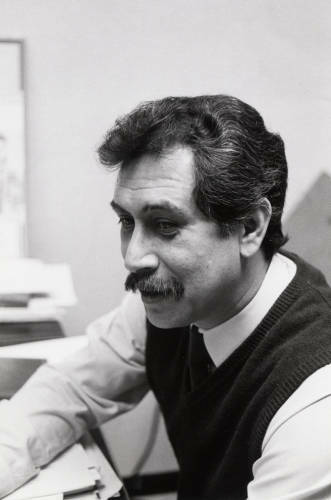 Carlos L. Cantú: As a former CMAS fellowship alumni and supporter of the work Tatcho Mindiola has done for the Mexican American community, on and off campus, it was exciting to hear that he was donating his papers to the Hispanic Collections at UH. He has a long reputation of helping underserved Mexican Americans achieve academic success. When I learned this was the collection to be processed, I thought it was quite an honor to be a part of it. Playing any role, no matter how small, in helping to make his collection available for the community is a true pleasure for me. Why do you think it’s valuable to make this material accessible? Because Tatcho has such a long history of political and activist involvement and has touched so many lives in the process – he really has been involved in many aspects of Mexican American struggles – researchers will find a rich collection of sources including rare documents and pamphlets; and extensive materials on the people, events, and organizations he has worked with in large and small roles. Although the collection will provide great insight on Tatcho’s work, his collection will also provide a rich perspective on the roles, experiences, and contributions of the Mexican American community in not only Houston but around the state and nation. As a historian, what do you find enjoyable about processing work and working in the archives? The best part is seeing the collection before anyone else does! And the most enjoyable part is seeing how some of my professors dressed and wore their hair in the 1980s and 90s! But at a more serious level, understanding the process and evolution of a collection provides me more appreciation of the work done behind the scenes. Just as historians search for patterns, develop a chronology, conceptualize an argument, and present their ideas, archivists similarly tell a story; however, it is in its most rawest form – it really is a thoughtful process – which I kind of understood, but I had never been a part of before now. It’s great that he donated his collection to UH. He started his academic career here and he retired here. 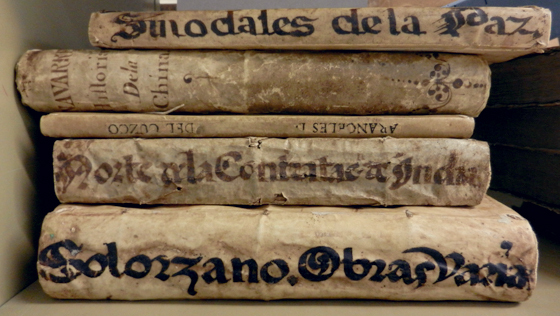 He is well-known on campus, and around the city and state; hopefully this addition of his paper will garner more attention to the new and growing Hispanic Collections. Carlos L. Cantú is a PhD candidate in the History Department at the University of Houston, currently working on his dissertation. 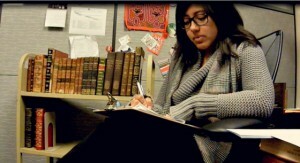 Cantú is an alum graduate-fellow for the Center for Mexican American Studies at the University of Houston. He graduated with a Bachelor’s in History in 2006 and he received his Master’s in History in 2008, both from the University of Texas-Pan American in Edinburg, Texas. His research examines the social history of education for ethnic groups in the U.S., and primarily looks at their struggles to create and shape community-controlled institutions of higher learning during the late 1960s and 1970s. His dissertation is a comparative history of three community-controlled institutions of higher education, Colegio Jacinto Treviño, a Chicana/o college in South Texas, the Navajo Community College in Arizona, and Hostos Community College in New York City. Preliminary research from his dissertation has appeared in published form and presented at academic conferences. The recent retirement of Tatcho Mindiola from the University of Houston is accompanied by the exciting announcement of the newest accession to our Hispanic Collections, the Tatcho Mindiola Papers. As we were reminded by those who spoke in tribute of Mindiola, his legacy has been forged at the University of Houston through hard work and relationships built through mentoring and collaboration. Born and raised in Houston, Mindiola grew up in Sunset Heights where he graduated from John H. Reagan High School in 1957 and was witness to both the overt and subtle racism of the day. After graduation a meandering path through the 1960s and early 70s included a false start in higher education, enlistment in the army, and an eventual degree in business from the University of Houston, before giving way to a study of sociology, graduate school, an MA from UH, and a PhD from Brown. In 1974 he would accept a dual appointment at his alma mater in sociology and Mexican American Studies. Mindiola’s return to Houston and appointment as director of the UH Center for Mexican American Studies in 1980 mark the beginning of three and a half decades of service and scholarship that gave rise to the educator and mentor so many revere. 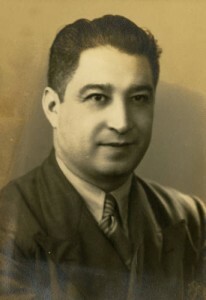 Under his leadership, CMAS has attracted top researchers via their Visiting Scholars Program, assisted rising scholars through their Graduate Fellowship Program, supported undergraduate academic success through the Academic Achievers Program, and published scholarly works on Latinos in Houston, Texas and the Southwest. Not only does our campus community bear the imprint of Mindiola’s impact, the City of Houston has benefited from his exchanges with local organizations and mentoring of area high school students. The Austin High School Academic Achievers Program he helped pioneer through CMAS mentors at-risk high school students as they seek to become first-generation college graduates in their families. Extremely approachable and a consummate diplomat, Mindiola’s influence also extends to national organizations, like the National Association for Chicana and Chicano Studies, that have benefited from his insight and counsel. 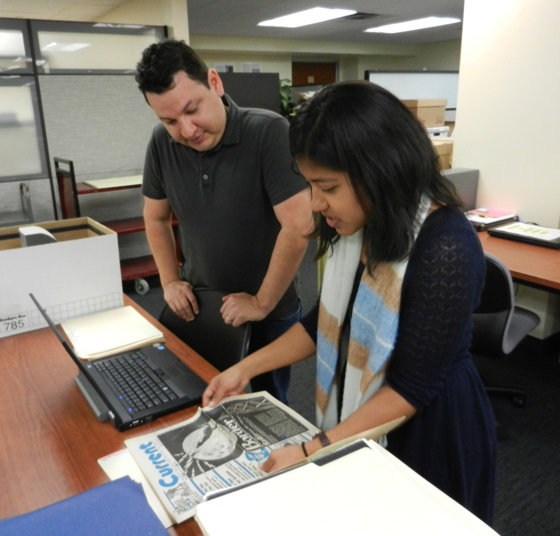 Work is now underway as Lisa Cruces, assisted by PhD candidate Carlos L. Cantú from the UH History Department, oversees the organization and arrangement of the Tatcho Mindiola Papers for future scholarship. This undertaking will no doubt provide more insight into their research potential and we look forward to sharing updates as processing of this new collection moves forward. Until then, researchers interested in more information regarding the Tatcho Mindiola Papers may contact our Hispanic Collections Archivist, Lisa Cruces. The following piece appears courtesy of Dan Johnson, 2013 Mosaic Fellow, wherein he provides a look at a sampling of projects benefiting from his internship with the University of Houston Special Collections. I was selected as a Mosaic Fellow in the Fall of 2013 by the Association of Research Libraries and the Society of American Archivists. I’m presently a MSLS student at the University of North Texas, studying Archival Studies and Digital Image Management. The Mosaic Fellowship included an internship component, pairing up fellows with host ARL institutions; I was glad to have the opportunity to intern here at UH Special Collections since September 2014. I’ve since had the pleasure of working on a variety of special projects, working hands on with archival materials. I first started a digital audit of the Ewing Family Papers, comparing the physical archival collection to its finding aid and existing digital collection. 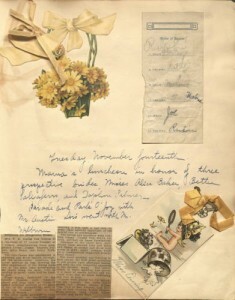 In that review of the Ewing family scrapbooks, I worked with Valerie Prilop, Digital Collections Librarian, and we discovered that the finding aid for one of the scrapbooks provided descriptions for only the front side of each scrapbook page, but did not describe the reverse side, while the digital collection had page-level descriptions for both front and back sides of the pages. Ultimately, we were able to identify places where the finding aid could be improved, and we made some recommendations to combine two digital collections, one per scrapbook, into a single consolidated digital collection, a project for a later date. I then started a project under the guidance of University Archivist Mary Manning, processing and describing additions to the William C. Moffit Papers. The collection was originally donated by Dr. Moffit himself, but several additions were later donated by his wife and family after he passed away. I was able to process and describe some additional manuscript parts, published musical arrangements, and Patterns of Motion training materials, among other things. Working with a member of the faculty from the School of Music who was intimately familiar with Dr. Moffit’s work helped me better describe and arrange the materials in a way that will make the most sense to researchers using this collection. I started work on a third project with Hispanic Collections Archivist Lisa Cruces, auditing the physical material of the Alonso S. Perales Papers and comparing the physical archival collection to the finding aid. There were a handful of items in the physical collection that were not reflected in the finding aid, and I have been correcting the finding aid to more faithfully represent the collection. Most recently, I’ve been given the opportunity to work with Librarian Emerita Pat Bozeman on a project transcribing and contextualizing some handwritten letters. Two of these items were taken from the Early Texas Documents collection. One item is a letter from Sam Houston written after he was wounded in the Battle of Horseshoe Bend. 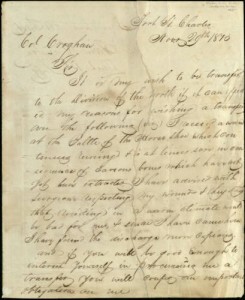 It documents his request to be transferred from New Orleans to a more northern location upon the advice of several physicians. Another item is a letter that highlights Stephen F. Austin’s efforts to gather support from the United States government and people for Texas Independence and was written in Nashville, Tennessee days before Texas declared independence from Mexico. Working intimately with historical documents such as these has been a very exciting and rewarding experience.